What Are The Risks of Bloodborne Pathogens? Contamination can also come from exposure to sharps, which is a term used to describe items like needles, broken glass, scalpels, and any other object that can penetrate the skin and cause infection. Source individuals are the people who bear the contaminated fluids and can potentially pass them on to healthcare professionals. Source individuals can be living or dead and are often encountered as blood donors, hospital patients, drug rehab patients, trauma victims, and by handling human remains of the deceased. Healthcare professionals are at risk of coming into contact with contaminated fluids or sharps in a number of ways. Infected blood and fluids can be ingested through the skin, eyes and open cuts. This risk of contamination on the job is referred to as occupational exposure. 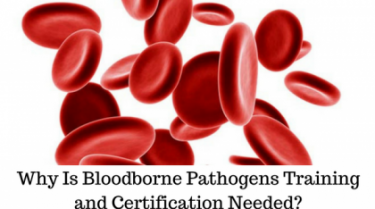 What will Bloodborne Pathogen Certification Do For Me? A bloodborne pathogen course will teach healthcare professionals how to eliminate the risks of exposure in the workplace. Students will be taught that all fluids should be treated as if they were contaminated since there is no way to differentiate between infected fluids and non-infected fluids without testing. When any blood or fluids are present, precautions like safe sharps disposal, wearing latex gloves when handling fluids, and surgical instrument disinfection should always be used. These methods are known as engineering controls and they will be a main component of bloodborne pathogen training courses. These disease control precautions are important measures for healthcare professionals to take in all situations to prevent exposure and contamination in the workplace. Training programs will teach all of these techniques and will certify students so they are compliant with Occupational Safety and Health Administration (OSHA) requirements. Bloodborne pathogen training will provide students with all of the information, tools, and precautions they need to safeguard their own health in the workplace and will give them certification for the necessary regulations that are required in the healthcare profession.